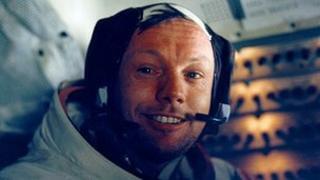 Neil Armstrong was a towering, if not mythical, figure in the world of spaceflight. As the world sat awestruck in front of their television sets, marvelling at the achievement of sending an emissary to the surface of another world, he was one person and every person. As President Nixon's plaque on the lunar module proclaimed: "We came in peace for all mankind". Armstrong's simple yet brilliant refrain about small steps and giant leaps - its intonation betraying such acute awareness of the historic nature of the moment - remains forever etched into the minds of a generation who witnessed the moon landings first hand. And there is the sadness, since, for those who dreamt that Apollo 11 was the beginning of a grand adventure, in which humankind would reach out to become an interplanetary species, Armstrong's passing reminds us just how distant those past glories are, and just how far away we are from achieving anything like it again. Nevertheless, the achievement of Apollo 11 brought an end to the space race, thus paving the way for global co-operation. It led first to the baby steps of the Apollo-Soyuz project in the 1970s and eventually to the landmark International Space Station. That, however, must have been far from the minds of Armstrong and crew members Edwin "Buzz" Aldrin and Michael Collins, when they returned from the Moon in 1969 as heroes. After smiling and waving through the ticker tape parades, public audiences and television interviews, Armstrong stepped out of the spotlight and tried to rediscover the obscurity from which he had emerged. He had further cemented his already legendary reputation for being cool under pressure during the first Moon landing on 20 July 1969 when it became clear that the guidance issued by Nasa to the crew would have sent them into a field of boulders. Armstrong had taken over manual control, flying the spindly lunar module "like a helicopter" to avoid the death trap and found a safe place to put down with 20 seconds of fuel left. But the steely-eyed former fighter pilot was also painfully shy. He retired from Nasa in 1971 to accept a teaching post at the University of Cincinnati. Trading the world stage for the more sedate pace of life in an Ohio farming community made perfect sense for this man of few words, who sought only to serve his country: "I don't want to be a living memorial," he once said. Former BBC aerospace correspondent Reg Turnill elaborated: "Armstrong was a very diffident and reclusive man. He got tired of being asked: 'What was it like being the first man on the Moon?' and he stopped doing interviews. Of all the astronauts he was the most reclusive. He was a boffin." But even in rural Ohio, Armstrong was never quite able to escape attention. In 2005, the astronaut threatened to sue a barbershop owner who had sold trimmings of his hair for $3,000. Mr Armstrong's family released a statement expressing their heartbreak at the passing of a " loving husband, father, grandfather, brother and friend". "Neil Armstrong was also a reluctant American hero who always believed he was just doing his job," they said, adding, "as much as Neil cherished his privacy, he always appreciated the expressions of good will from people around the world and from all walks of life." Buzz Aldrin, who accompanied him to the lunar surface, also paid tribute, telling the BBC World Service's Newshour: "We will miss a great spokesman and leader in the space programme." Apollo 11 command module pilot Michael Collins commented simply: "He was the best, and I will miss him terribly." President Obama paid tribute to a "hero not just of his time, but of all time", and fellow astronaut and Nasa administrator Charles Bolden said: "As long as there are history books, Neil Armstrong will be included in them, remembered for taking humankind's first small step on a world beyond our own." Armstrong occasionally gave public addresses as an advocate of human spaceflight, but generally steered away from making pronouncements on space policy. However, the Apollo 11 commander memorably spoke out against Barack Obama's cancellation of the Constellation plan to return humans to the Moon by the early 2020s. Speaking at a Senate hearing in 2010, Armstrong warned Congress: "America is respected for the contributions it has made in learning to sail on this new ocean. If the leadership we have acquired, through our investment, is simply allowed to fade away, other nations will surely step in where we have faltered." Those views are common among other astronauts of his generation, who have expressed dismay at the thought of the US ceding a pre-eminent position in space won through grit, determination, imagination and blood, to emerging space powers such as China. The Asian superpower recently outlined its own plans to put humans on the Moon in the 2020s. And though a former administrator of Nasa once told me that "you can only be first to the Moon once", the announcement by China will rankle with those who lament that America's glories in space now belong to another era. In a rare interview, Armstrong gave almost an hour of his time this year in a video conversation with the Certified Practicing Accountants of Australia (CPA). He repeated his criticisms of the current direction of the US human spaceflight programme, saying it lacked ambition compared with the big thinking of the 1960s. But the interview also provided a rare insight into the mind of this most private of history-makers. In it, Armstrong described how he had become fascinated with flight as an elementary school student, and determined that, "somehow, I wanted to be involved in that". President John F Kennedy's speech at Rice University in 1961, which laid down the gauntlet for a landing on the Moon, seemed a daunting challenge at the time, especially when the US had only sent Alan Shepard on a 20-minute sub-orbital flight. "Now the president was challenging us to go to the Moon," he said. "The gap between a 20 minutes up and down flight and going to the moon was something almost beyond belief, technically." He also revealed that, to his mind, touching down safely on the Moon had been far from certain: "I thought we had a 90% chance of getting back safely to Earth on that flight but only a 50-50 chance of making a landing on that first attempt." However, Armstrong remained optimistic about the future of human spaceflight, once telling the BBC's Pallab Ghosh that: "The dream remains! The reality has faded a bit, but it will come back, in time." In their statement, Armstrong's family talk of a man who never lost his "boyhood wonder" at the pursuits of aviation and spaceflight, adding: "For those who may ask what they can do to honour Neil, we have a simple request. Honour his example of service, accomplishment and modesty, and the next time you walk outside on a clear night and see the moon smiling down at you, think of Neil Armstrong and give him a wink."